The differential analyzer was a mechanical analog computer, built during the 1930s. Input and output functions were drawn or read off of charts. 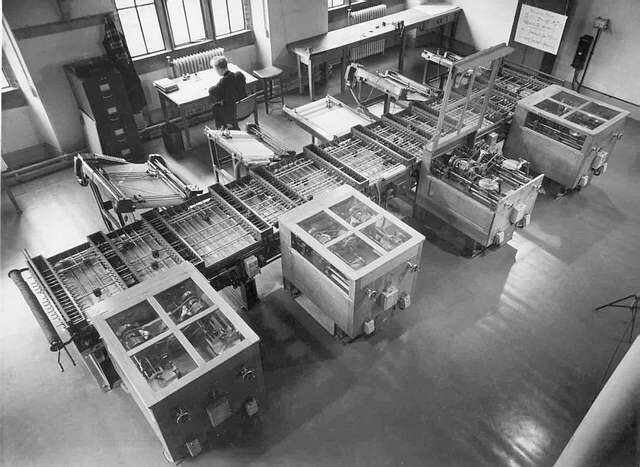 The four windowed cabinets contained mechanical integrators. Running down the center was a bed of rotating shafts ("bus rods") that interconnected the I/O tables with the integrators. Gears allowed the shaft rotations to be multiplied or added together. The torque amplifier was a key invention. Mechanical integrators contain a knife-edge disk that rolls against a polished glass plate, and that tiny force must subsequently drive the bus rods. The amplifer was similar to a ship's capstan, the input torque tightening a cable wound around a motor driven drum. 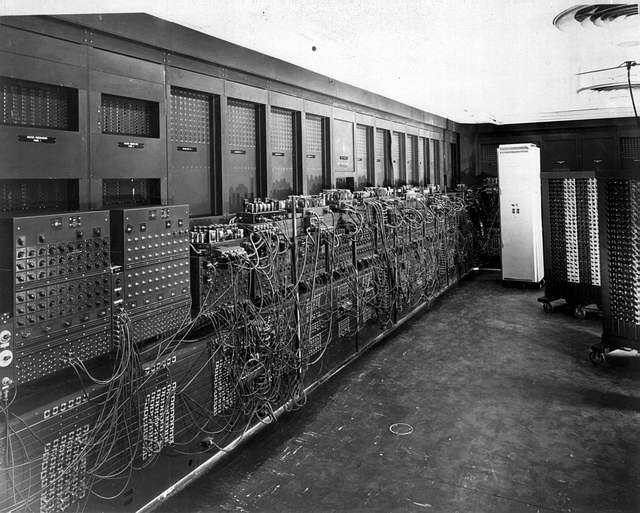 Built in 1946 by J P. Eckert and John Mauchly, the ENIAC was an electronic, digital computer. It was not a stored-program machine, however. Patch panels were used to set up a data-flow program between arithmetic, loop-iteration and logical units. ENIAC contained about 18,000 vacuum tubes and operated at 1000 Hz. Eckert and Mauchly later formed UNIVAC Corporation, the first commercial computer vender.